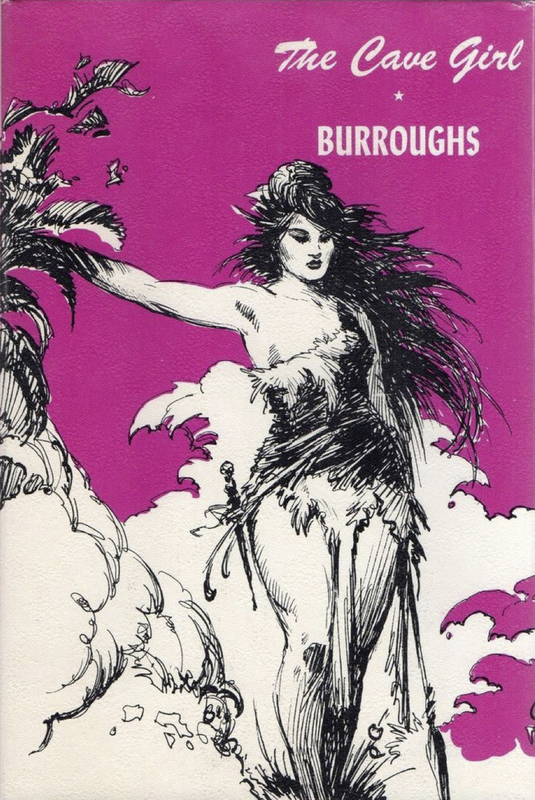 In February 1913, fresh from the success of "Under the Moons of Mars" and "Tarzan of the Apes," both published in magazine form in the previous year, Edgar Rice Burroughs began work on a new novel, again to take place in a lost world. Entitled "The Cave Girl," it was serialized in The All-Story in July through September 1913. 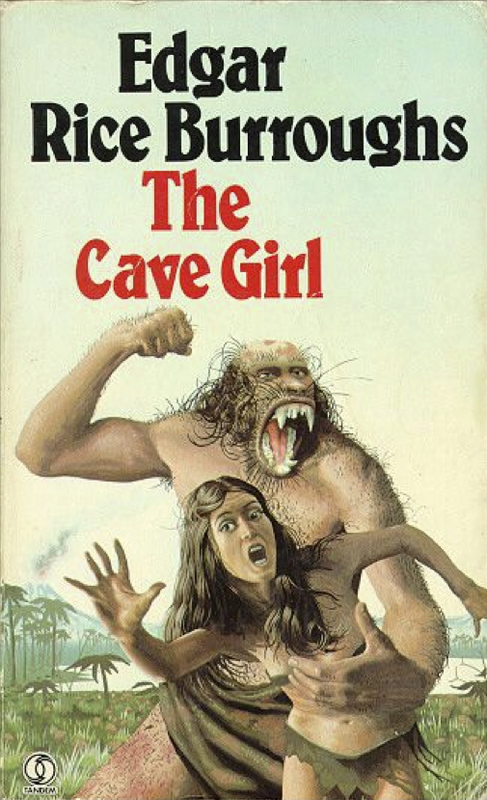 Like most of Burroughs' novel-length stories, it was reprinted in hardback, in this case as The Cave Girl in 1925. A sequel, "The Cave Man," appeared in All-Story Weekly in March and April 1917, but it doesn't seem to have been reprinted until recent years, and then only digitally. The Cave Girl is the story of a contemporary man, Waldo Emerson Smith-Jones, and his adventures on an unexplored island in the South Pacific. There he finds and is rescued by a cave girl named Nadara, who returns him to her village. Along the way, she dubs him Thandar--"The Brave One." In actuality, he is a weak, fearful, and bookish scion of Back Bay, Boston, but over the course of several months' training, Smith-Jones--now Thandar--strengthens his body and learns to survive in his new home. He falls in love with Nadara and becomes a leader of her people. After further operatic adventures, Thandar--now Smith-Jones--is reunited with his parents. It is revealed then that Nadara's parents came from the outside world and that she is actually an aristocrat by the name of de la Valois. Thus the way is cleared for her to marry her champion. Very convenient. 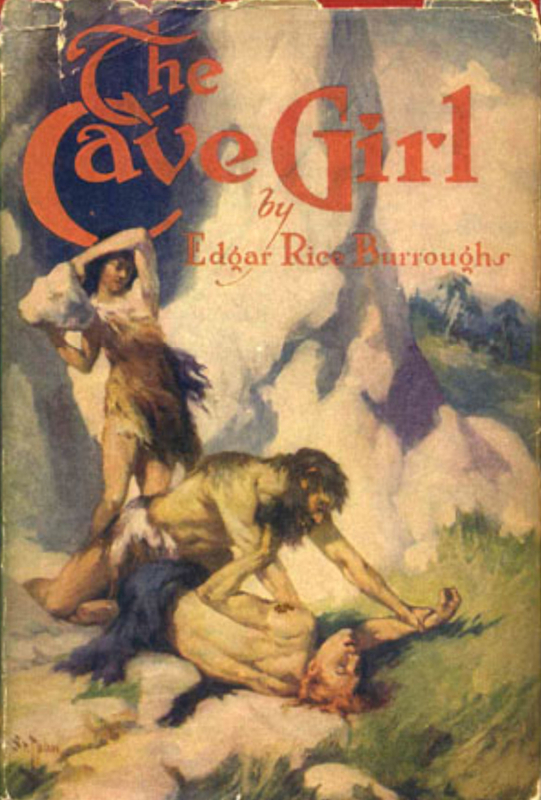 The Cave Girl went through seven hardbound editions from 1925 to 1940. In 1949, Dell issued a paperback version as part of its famous "map back" series. Many more paperback versions followed over the years. The story of the cave girl Nadara and her almost anagrammatic lover Thandar is now in the public domain. Consequently, it has proliferated in our digital age. In 1985, that golden age of teen movies, Crown International Pictures released Cavegirl, in which a boy from the twentieth century travels back to prehistoric times, there to find the girl of his dreams. 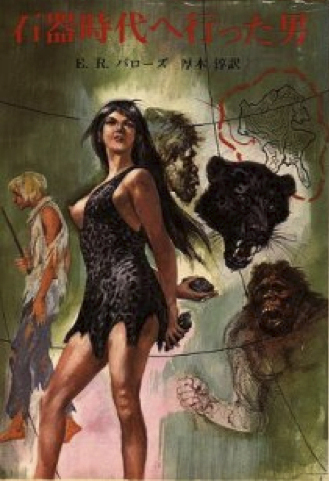 It's unlikely that Cavegirl has anything to do with The Cave Girl, although the conventions of the lost-world story seem evident in its plot. Many years before, in January 1952, a new comic book appeared on the newsstand. 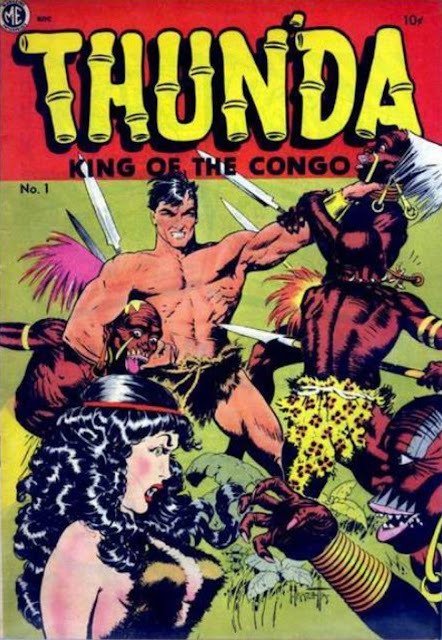 Called Thun'da, it was the work of writer Gardner Fox (1911-1986) and artist Frank Frazetta (1928-2010). Frazetta was then only twenty-three years old, but he had already been in the comic book business for seven years. Thun'da #1 would prove to be the only comic book that was entirely his work. In that inaugural issue, Roger Drum, an American airman, crash lands in a lost valley in Africa. Like Smith-Jones before him, Drum spends months conditioning himself for his new life. He also finds in Pha, a beautiful native of the valley, the love of his life. Also like Smith-Jones, he becomes the leader of her people. And like him, Drum earns a new name, the Thun'da of the title. Thun'da ran for six issues in all in 1952-1953. Bob Powell (1916-1967) took over for Frazetta in Thun'da #2. Gardner Fox and Bob Powell introduced a new character in that second issue. Called Cave Girl, she is Carol Mantomer, the daughter of two Americans killed by African natives. Like Mowgli, Cave Girl is reared by animals and lives among them as their friend. Thun'da guest-starred in the first Cave Girl story. She had a backup feature in Thun'da #2 through #6, then got her own title for four issues (#11-#14) published in 1953-1954. As for Thun'da, he became the backup feature in Cave Girl. 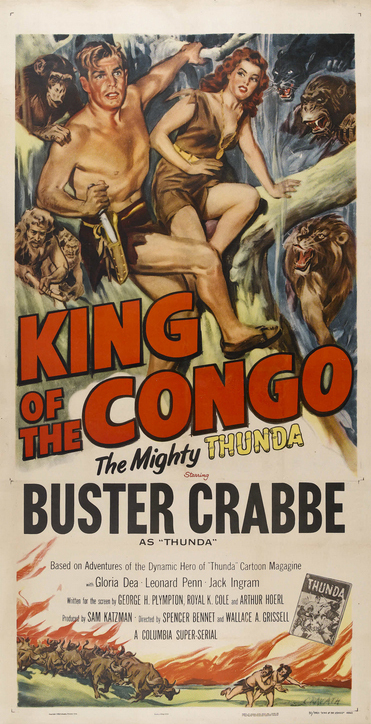 In 1952, his story was adapted to the silver screen in King of the Congo, a serial starring Buster Crabbe. Gardner Fox was a prolific author and a voracious reader in every field. "Knowledge," he said, "is a kind of hobby with me." His library was vast, and he kept filing cabinets full of story ideas. Like so many writers of his generation, he grew up reading the novels of Edgar Rice Burroughs. There can be little doubt that he encountered The Cave Girl somewhere along the line, and certainly no later than the Dell paperback edition of 1949, for it's clear that Thun'da and Cave Girl are drawn from Burroughs' story. The names alone--Thandar vs. Thun'da--are the first bit of evidence. 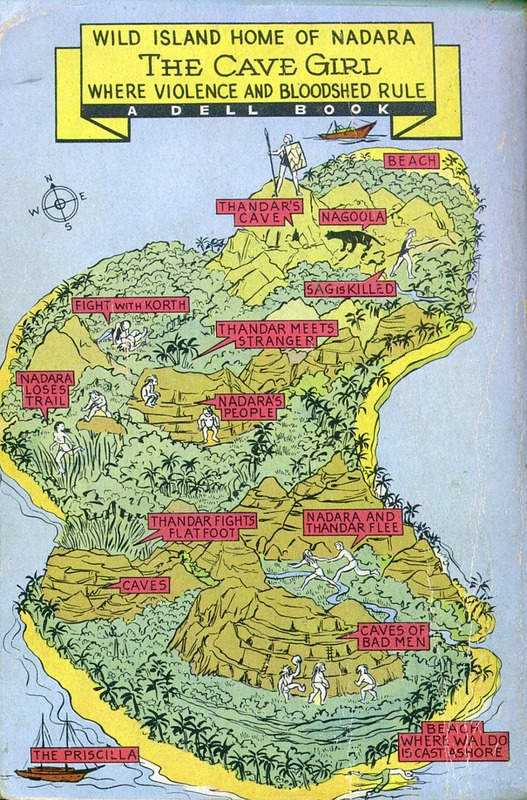 Beyond that, the plots are more or less the same, as are the origins of the cave girl character in each. None of that matters now, for Burroughs' version and the Fox/Powell version of Cave Girl are in the public domain, and that's how she came to be in Five Star Comics as well. 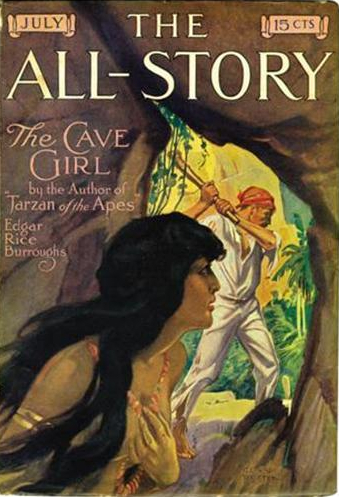 "The Cave Girl" was a serial in The All-Story before it was a book and long before it was a comic book. It appeared in the magazine in three parts, July through September 1913, and made the cover in July. The artist was Clinton Pettee (1872-1937). The Cave Girl was issued in hardback in 1925 with a dust jacket by J. Allen St. John . . .
And in paperback in 1949 with cover art by Jean des Vignes (which may be a pseudonym). 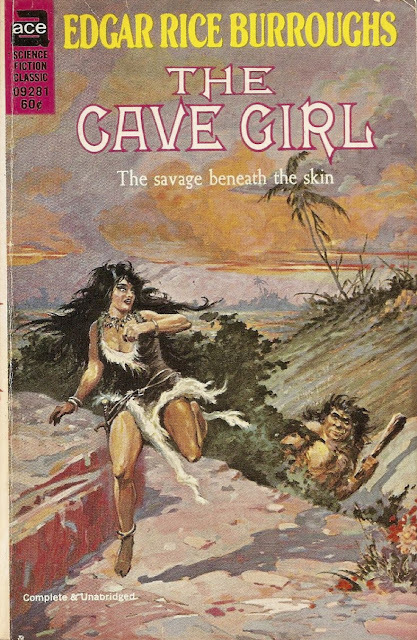 The Cave Girl also appeared in foreign editions. Here's one, I think from Japan. The artist may not have seen the Dell map back, as his island has a different configuration. 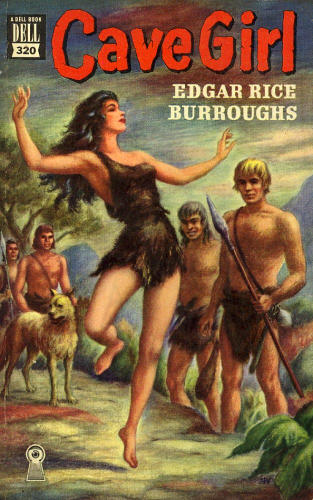 Ace issued many of Edgar Rice Burroughs' books beginning in the early 1960s. Here is Roy G. Krenkel's cover for the 1964 edition . . .
A reprise of his role for Canaveral Press two years before. He and Frazetta were of course friends and sometime collaborators. 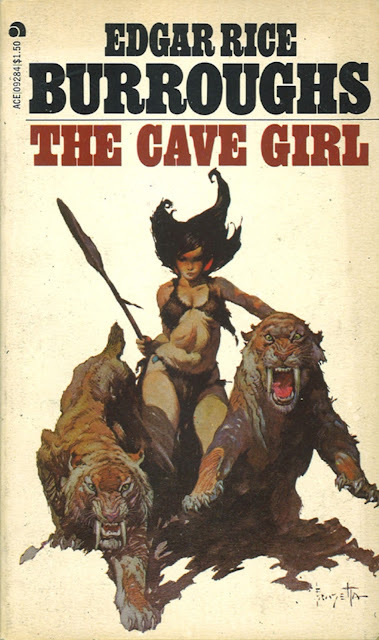 Frank Frazetta didn't draw the adventures of Cave Girl in the comic books. That was Bob Powell. But he did draw the heroine Pha, who was no doubt based on Burroughs' original character. Here is Cave Girl again on the cover of the later Ace edition, from 1973, in Frazetta's unmistakable manner. Here is a British edition issued by Tandem. The artist is uncredited. It's interesting that depictions of the Cave Girl alternate between fearful or submisive and courageous or dominant. Frank Frazetta had many great qualities as an artist. His unimaginative reliance on racial stereotypes was not one of them. This is his cover illustration for Thun'da #1 from January 1952. It was the only comic book that was all his. Gardner Fox wrote the script. A page of Frazetta's art from that first issue. Note the sequence of training and conditioning as in Burroughs' story from nearly forty years before. 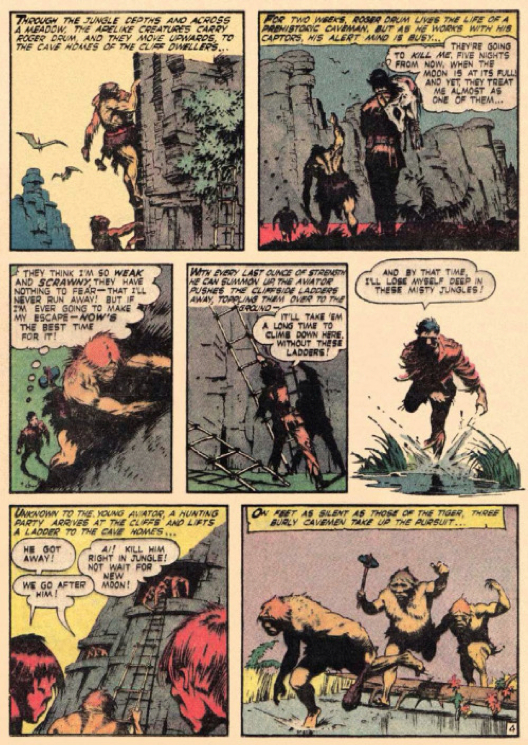 Note, too, the Wally Wood-like figure in the bottom left panel and the Tarzan-like pose in the bottom right. Frazetta was a great admirer of Hal Foster. (Who isn't.) You can see that, especially in his early work. 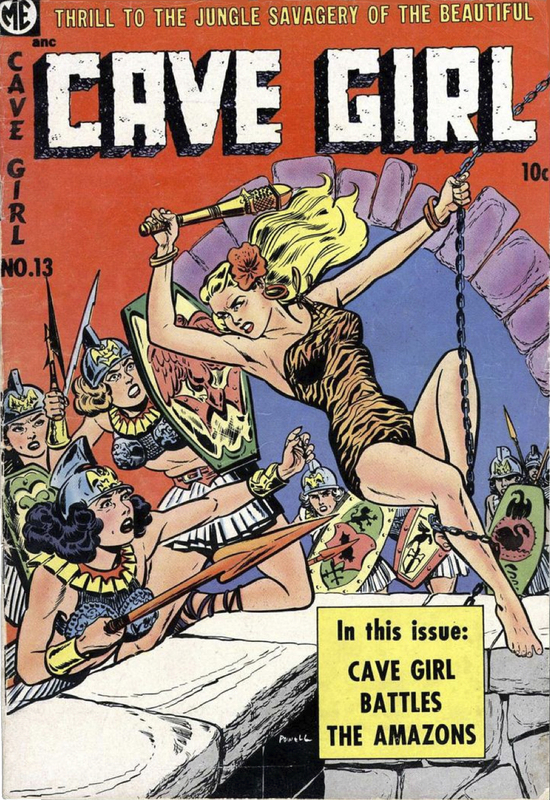 In her journey from pulp magazines of the 1910s to the public domain of today, Cave Girl made a stopover in the comics. If it weren't for Gardner Fox, Frank Frazetta, and Bob Powell, she may well have been forgotten except by Burroughs fans. Now she is in our very own Five Star Comics . . . but that's a story for another time. Note: Not long ago, I read Dian of the Lost Land by Edison Marshall, from 1935. It is very much like The Cave Girl and other stories of lost worlds in that a visitor from the effete or decadent outside world finds in himself courage, strength, hope, and fortitude in a place out of time. In Dian of the Lost Land, the protagonist also finds his true love in the queen of the people of that world. As it turns out, she, like Nadara, is the daughter of an outsider, thus is avoided any distasteful intermixing of peoples. Sometime between then and the movie Planet of the Apes (1968), the idea that a modern man can not and should not love a savage or primitive woman disappeared. Edison Marshall (1894-1967) turned eighteen in the year that Edgar Rice Burroughs' first two fantasies went to print. A budding writer, he could hardly have been less impressed by Burroughs than others of his generation. He had his own first story published in The Argosy in 1915. In "Og, The Dawn Man" (1928, reprinted in hardback as Ogden's Strange Story in 1934), Marshall wrote about a man who crash lands in the Canadian wilderness and reverts to being a caveman. In Horrors Unknown (1972), Sam Moskowitz compared him favorably to Burroughs and to Rudyard Kipling. Dian of the Lost Land seems to have been Marshall writing in the mold of Burroughs. One difference is that Marshall was superior as a stylist.